Do you like Cheerios? Do you like Chocolate? Then you are going to love Chocolate Cheerios. I received some from MyBlogSpark to try out. And I know one person in my house who is very happy about it. That is my daughter. Actually my husband too. I know my daughter likes something, when she makes the mmm...mmm...mmm sound when she eats something. And that is what she was doing when she ate some Chocolate Cheerios. 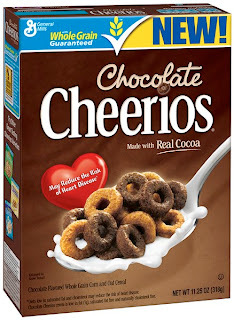 Chocolate Cheerios are low in fat, heart healthy, have 100 calories per serving, contain at least 8 grams of whole grain per serving (at least 48 grams recommended daily), and is a good source of calcium and vitamin D. Made with real cocoa, Chocolate Cheerios can help your family start the day off right with a delicious and nutritious breakfast that is sure to make you smile! Also included in my package from MyBlogSpark was some really neat bath stuff. I received some chocolate soap, chocolate body wash, chocolate bath salts and a bath scrunchy. 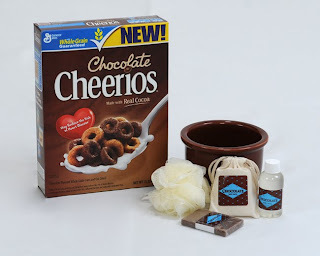 Oh yea, and there is also a really cool bowl to eat the Chocolate Cheerios in! Mandatory entry: Tell me what you or your family does to start your day off with a smile. 6. For 3 extra entries blog about this giveaway, linking back to this post. RULES: Giveaway is open to US Residents only. Giveaway ends February 7, 2010 11:59 PM. Winners will be chosen via Random.org. Must have valid email in blog profile or leave email in comments otherwise you will be disqualified. Winners will have 48 hrs. to confirm by email, If no confirmation in that time frame a new winner will be chosen. Disclaimer: Cheerios provided me with the free product, information, and gift pack through MyBlogSpark. We play Legos in front of the fireplace. It makes my boys smile and starts our fun day. We like to eat breakfast together to start our day off...it's nice to hear what everyone has planned for the day before we all go our separate ways. My day starts off when I got into my little ones room and there she is standing up waiting for me to grab her. I am almost finished with my box of these. They are so yummy..
Our day starts of with kisses in the morning. Nothing beats waking up to the sounds of the kiddies. To get our day started off right I like to go in my daughters room and talk to her about all the fun things that could happen that day. Some of them are silly but I like to spend that time with her while the house is still quiet and before we start rushing around! My family starts off with reading the Bible. It helps everybody's attitude during the day!! We love to hear and sing with the music, to get ready! And eat a healthy breakfast. My family begins our day w/ a prayer. The only way to start your day! In the shower, gulping down breakfast, or in the car on the way to school/work is the best way to get and keep smiling throughout the day! I get up early and enjoy a cup of tea and some yogurt. I always try to wake them up with a smile. Maybe a time of sitting there and talking with them:) Wake them up slowly and the day will go better. Please enter me. Thanks!! Following you on Twitter and I tweeted! We start our day with a nice cup of coffee and a walk around our neighborhood with the dog. Our dog forces us to get out, even when it's cold, but we always feel great when we get home and more able to face the day ahead! My 16 month old daughter always wakes up smiling. And when she waves at me and says "mommy" that makes me smile too. We snuggle first thing before I make my son get dressed. Even though he is getting to the age where he sins;t as interested in snuggles during the day, he still comes to my bed for a quick morning snuggle. It makes BOTH of us smile. I go for a walk before anything else. It gets me going and gives me a little time to myself first thing. My 4-year-old always says something hilarious. This morning she told us that she was "nose sick!" We also listen to fun music in the car on the way to school. i go into each of their rooms and wake them with kisses! they love it! i follow by google connect! We sings songs as all the kids are getting dressed and brushing teeth. We start and end each day with hugs & kisses -- good for lots of smiles and warm fuzzies all day :) *Thanks* for the giveaway! My older son gets in the crib with the younger one and they play for a while. it's so cute. My husband and I always say 'I love you' before he leaves for work. My family starts our day off with a smile by eating breakfast together. I play some music and it usually gets everyone in a good mood and moving. We normally have a silly joke to start the day out with. #1, I am a follow through Network Blogs. #2, I am a follow through Network Blogs. We start our day off with a smile by playing with our daughter -- just taking time to hang out all together as a family before all the craziness of the day begins. I start each day off by calling my mom. We enjoy a nice chat each morning before I head off to work. We eat breakfast and sing and dance along to the radio! My husband and I take turns playing with our son, Sam while we get ready. I love that he has both of us to have fun with in the morning. I call my son so I can hear his voice and then my day can start. I chase my daughter around the house--seriously, she's three, and nothing makes her giggle and smile more than playing chase! To start the day with a smile, we get up 1/2 hour earlier. So we have some time to visit over a light breakfast. I love the million dollar hugs I get from my daughters in the morning! My kids come into our bed first thing in the morning so we start with cuddles and hugs and kisses. #1 I have your button. #2 I have your button. #3 I have your button. I like to make sure and get as much ready the night before as possible. That way, we're not rushing around all stressed out in the morning! We always start our morning off with hugs and smiles. Following your blog w/Google Friend connect. Thanks! We like to read the Bible together as a family, usually right before or right after breakfast. It's a great way to start the day off right! To start our day off with a smile, me and my kids sit down at the breakfast table and read a missionary story or the Word of God. It's always nice to start our day with the Lord! :) Thanks for the giveaway! We try to start the day off with juice for a smile! :) Thanks for the giveaway! I have three toddlers and just hearing them call my name each morning gives me a big smile! I used to be a grouch in the morning and now...I have 3 bundles of joy to motivate me! We always ask our 4yo son if he had pleasant dreams and what he dreamed about. He doesn't really understand dreams, so he always gives the same wander of "milk, vitamins, and breakfast." He loves his gummy vitamins and Honey Nut Cheerios..I bet he would like chocolate cheerios too. I follow your blog (publicly) with Blogger / Google Connect. I wake my girls up with a funny song everyday. We start out our mornings with our pups laying next to us and they wag their tails to say "yeah, you are awake, now let's go outside!" It is always fun to start off our mornings with love and affection from them. I follow you via Google Friend Connect as Shannon. We usually cuddle in the morning! Getting enough rest the night before is key! About 5:30 my husband brings me a cup of coffee and let's me have about 15 minutes of peace and quiet before starting my day. We start our day off with a family breakfast and then watch cartoons with our son before daddy goes to work.